I found finding the subject matter for this one a little tricky and after experimenting with various ideas I have plumped for this one, though not entirely happy. We were asked to find a subject with an a large, even background and take a few shots of the object in various parts of the frame. This is to demonstrate how the framing can change the relationship between the subject and the background. 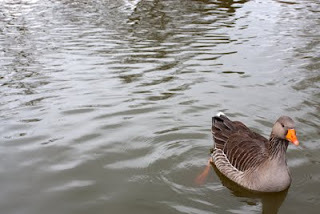 The background in my examples was water and the subject matter a rather obliging goose, although I think that the only reason she was hanging around for the hope of some bread! In the first image the subject is centred. Here the subject dominates the image and distracts from the vastness of the water. 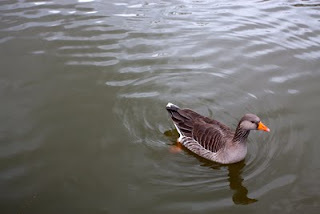 In the next image the goose is position slightly off-centre, moving to the right. 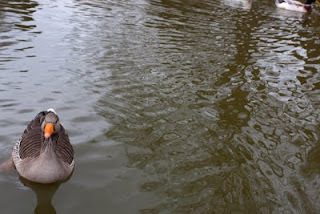 Here the water is more prominent but the eye is still firmly on the subject. 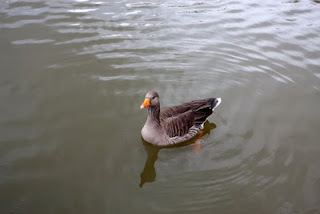 In the next image the goose is positioned to the far left of the frame, here she is not dominating the scene and the expanse of the water is visible balancing out the scene. In the next photograph the image is to the bottom right and still occupying the majority of the image but showing some balance with her surroundings.